Mike's Best Blog Ever: That's OK, We're All Stories in the End. So... Doctor Who Series 5 (Series 31 if you don't want a boring lie, or Series Fnarg according to Steven Moffat). It's very good. Writing, effects, stories, it's all top-notch stuff. Really, it is. There's no question: I want to own this on DVD. At the earliest opportunity. Or before. But the lead actor was not winning me over. Sorry, but he wasn't. I found many moments of amusement with the writing but I couldn't feel much for this Doctor. Matt Smith seemed like a bit of a flake. I found myself weirdly dismissive of him. Could not see what Moffat and Co saw in the guy. 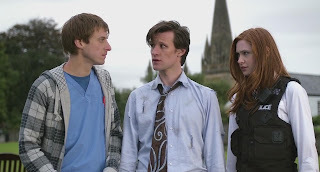 My current theory: they needed me to love his companions Amy and Rory so much (Which I did. At once.) that they didn't give the eleventh Doctor much chance to make his mark with me. He doesn't get to DO that much! Fast talking I couldn't follow. Or very withdrawn and quiet then suddenly 'Shut up' would pop out. It was becoming his catch phrase and I was taking it personally. HOW in hell could the Doctor say he LOVES the reptilian 'Mengele' who nearly sliced poor Amy open minutes earlier, but they cut the line from the same story where he says he LIKES Rory? He's too meek. He's too goofy. I was noticing all this episode after episode. Why don't I like him? I was trying to find something other than a bit of clever written business. Trying really hard to like him for HIM, if that makes sense, and I know it doesn't. How do some people just never click? When 'The Lodger' came along I was nearly there. The football playing seemed to be more about Matt than about the Doctor. But I did enjoy his efforts at being a matchmaker, even though I still identified better with Craig than with Doc 11. ...the universe ended. Complete and total Game Over. No way out. And the Doctor popped up anyway. I was flabbergasted. I was entranced again, watching the story unfold with childlike joy, and there he was in the middle of it. My prejudices lifted. He.. Is.. THE DOCTOR. He's weird and mad and impossible. He's goofy: like 2 was goofy. He's meek: like 5 was meek. He's a good footy player, he's a bit flakey, he's too young, and he's UNSTOPPABLE. The end of the universe barely slowed him down and I sure as hell can't stop him and thank the stars for that. "It's a thing in progress," Eleven once gibbered, "Respect the thing!" and also admitted sheepishly "Do I have a face nobody listens to... Again?" So, currently, I like him about as well as 5. 10,7,4,9,2,11,5,8,6,3,1, that's my order of affection, which Doctor I'd rather be (or be friends with), you'll think differently, I guarantee it, and thank the stars for that, too. 'Doctor Who' deserves to run forever, and I believe in one way or another, it always will. But for now it's time to say good-bye. LEAST FAVORITE ELEVENTH DOCTOR STORY (SO FAR): That overcooked Silurian hash in the middle (The Hungry Earth/Cold Blood). 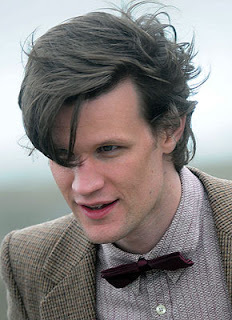 FAVORITE ELEVENTH DOCTOR QUOTEs: "If something can be remembered, it can come back." "The Universe is huge and ridiculous and sometimes there are miracles."